Plasma TVs - The New Face of Television! The Plasma television is the new face of television and is one of the most exciting development in home entertainment in recent years. Plasma television is considered to be the ultimate in TV technology with it's amazing picture quality and very thin Plasma Screen design. They are available in a range of sizes from 32 inches, 42 inches up to 60 inches and beyound. The most popular size is presently the 42 inch. The idea of the Plasma display or the Plasma Screen began in 1964 at the University of Illinois and although rather crude to begin with, it has developed into something quite impressive. The best plasma sets support High-Definition video and also feature a wealth of digital and analogue connectivity. Plasma Televisions use a much different type of technology (pixels) than CRT models. Using a video signal the pixels on the flat screen light up with a high-energy beam of electrons that are separated into the three primary colours, red, blue and green. From these you can obtain a full colour spectrumm which in turn give you the image on the screen. The widescreen design is another feature of Plasma Televisions. This is the same aspect ratio as found in most cinemas giving television viewing the look and feel of being at the movies. There are also no scan lines as with CRT televisions, so the picture is much sharper. Also you don't need to be sat right in front of the TV to see the picture - Plasma Televisions have a viewing angle of 170 degrees. The are also very thin - some being as small as only 3.3 inches in depth meaning you can hang them on a wall leaving you more floor space. 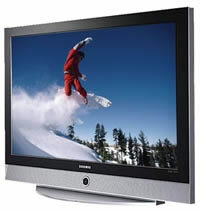 Plasma Televisions are also well suited for the new High Definition Format. HDTV is up to four times more detailed than conventioanl TV and is presently a big talking point. The BBC will be starting trials in 2006 with the main aim to product all it's programmes in High Definition HD format by 2010. Sky plans to launch it's GDTV in 2006. Further Details about The BBC's plan for HDTV can be found on the BBC website or by visiting their page on HDTV . So who manufacturers these thin Television displays? You can choose from numerous brand names, e.g. Sony, Samsung, Hitachi, Panasonic and Philips . The pictures shown on this website are examples and do not represent the manufacturers products.